Hi! My name is Sara and I'm enthusiastically writing Passing Fancy, mostly beauty blog. My good, old trusty blog is written since January 2011, named after my first Mac lipgloss and filled with various beauty items from all over the world. Although I'm based in a small country called Slovenia, it's not a limit to try new products and brands from European, Asian and American market. 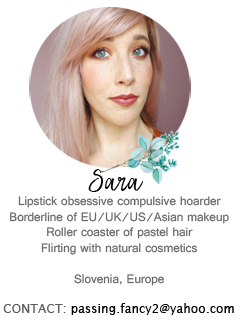 I'm especially passionate about Asian cosmetics, while easily accessible European products don't really slip by. Lipstick is the best way to my heart and I'm a self-proclaimed obsessive compulsive lipstick hoarder. My degree from psychology doesn't make it any easier. I have a weak spot for makeup but I'm also passionate about haircare and skincare. Especially for natural, organic skincare where I just began to sprout. On the streets, you can always spot me by my pastel hair - pink is my favourite. I have dry skin, prone to hyperpigmentation and all women in their late 20's can relate to my skincare experiences. 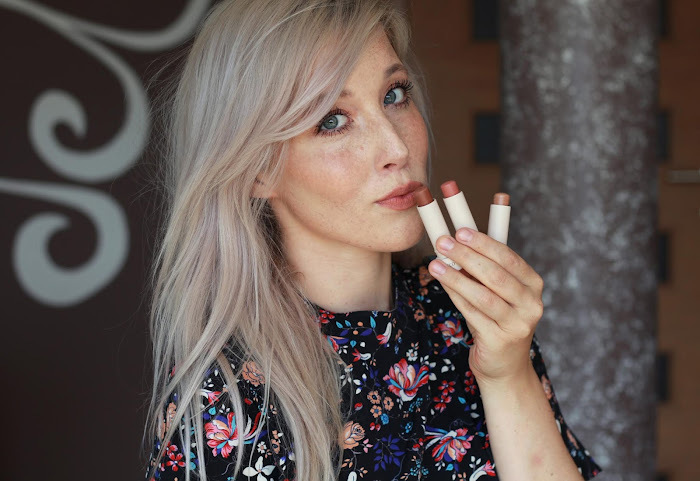 I have signature freckles so I like to try various products for glowing and even skintone. Oh, and the most important thing: I hate classic red but I'm passionate for all other, various shades of lipsticks. I'm PR friendly and love to honestly review beauty and lifestyle products. Upon requests, I write in both languages - Slovenian and English. I'm passionate about doing makeup looks, indepth reviews and mixed eye candy flatlays. I also cherish feedback from my readers and love to chat about beauty bits. of course you can. Vichy peeling is exfoliator and then, you can easily apply all of your serums and creams. Don't forget to apply SPF the next day!